Joe breaking in his new boat with his first few hybrid stripers. Weather: A little cool after dark, calm wind, not many clouds. 77 degrees dropped to 59. Wind SW at 6mph then calm. Moon: Waning, a day before new. Moonset 7:16pm. Underfoot 12:27am. Water Conditions: Greenish hue, 80 degrees. I'm not a huge fan of summer. I would much rather be standing on 10 inches of ice during a string of 20-degree days than trying to figure out how to catch something worthwhile in the stagnant, weed-infested bathwater that we have here in Jersey during the "dog days" of summer. And you can quote me on that this winter. I don't make a habit of fishing for muskies when the water temps are over 80 degrees, carp fishing can be painfully slow, there are no decent catfish waters close to home and I have zero interest in hopping on a party boat or surf fishing for fluke or bluefish. One thing that has become a bit of a tradition, however, is to do a night trip on Lake Hopatcong for hybrid stripers. I've caught my share of hybrids at this point, and they can still be a blast. In fact, even the mighty musky has nothing on the drag-screeching power and speed of a hybrid striper hooked on medium action tackle. And to boot, JoeLo just got a shiny new boat, from North Jersey marine, which just happens to be on Lake Hopatcong. So he decided to pick it up from North Jersey and take it right to Lee's County Park to launch it. Matt and I met him there at about 7pm after he was done joy-riding to see if we couldn't figure out a way to put him on his first hybrid. The boat, btw, is gorgeous. Joe got himself a beautiful new Lund that I'm sure will see a million muskies before he retires it many moons from now. Congrats buddy!! This night had all the earmarks of a fish fest. The lake was somewhat empty as night approached, and as we set our first two anchors at dusk and dropped baits in the water, we had a rod go down immediately. It turned out to be a white perch, but the action continued and we picked away at few hybrids. Joe got to land his first, second and probably third and fourth hybrid striped bass. 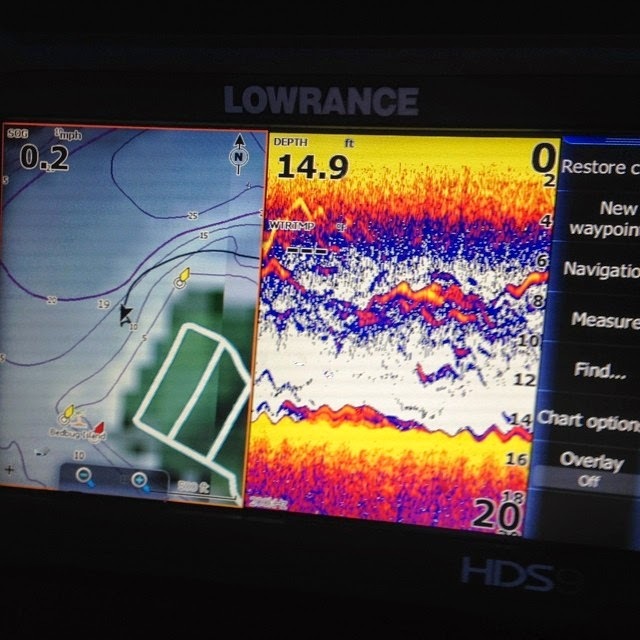 The sonar had been lit up with all kinds of bait and what was most likely a school or two of perch and hybrids, but as darkness fell, they stopped eating. We stayed at the spot for awhile before moving around several times trying to find more bait. We did find a few other schools of bait and fish, but none wanted to eat. Persistence never paid off, and the action at dusk wound up being our only action for the evening. Still, Matt, Joe and myself had a total blast cracking jokes, eating potato chips with chicken livers on our fingers and trying to figure out different ways to change the bite. It just wasn't going to happen. Things are definitely looking up here in New Jersey though. As I sit here on my couch on a rainy Saturday, the rods are ready for musky fishing tomorrow. The precipitation mixed with some cool nights has brought water temps down and rumor has it a few ski's are biting. Joe and I are gonna see if we can't stave off a skunk on the new ride and hopefully put a fish in the boat tomorrow. After that we're off to the Allegheny for a few days, two of which we'll be fishing with Red Childress for muskies. I'll be sure to get posts up and let you know how it all goes down.